Minar Jonban (Meaning Shaking Minarets) is located in a village six km from Isfahan. 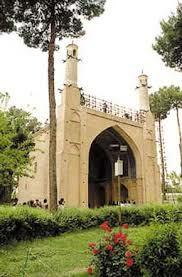 It was built built during Ilkhanate era on one of the cleric‘s tomb, but the two minarets were added by. The main building is 10m high and each minaret is 7.5 m. By shaking one minaret, the whole building shakes too, but the mechanism of this amazing building is still unknown.